Before he outraised every other presidential primary candidate in American history, Mr. Obama marched students through the thickets of campaign finance law. Before he helped redraw his own State Senate district, making it whiter and wealthier, he taught districting as a racially fraught study in how power is secured. And before he posed what may be the ultimate test of racial equality — whether Americans will elect a black president — he led students through African-Americans’ long fight for equal status. Standing in his favorite classroom in the austere main building, sharp-witted students looming above him, Mr. Obama refined his public speaking style, his debating abilities, his beliefs. 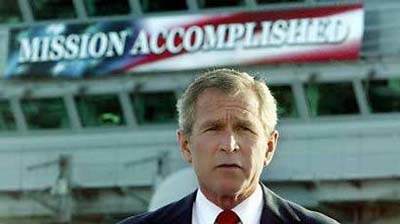 If Fakenation ever comes to terms with itself, this image will have to go down as one of the most ironic pieces of propaganda ever supplied to the public, right up there with Bush's "Mission Accomplished" banner proudly inaugurating the new state of endless civil chaos in the Middle East. You can, of course, draw several nearly identical diagrams to describe relationships involving the Obama administration. Either the law professor sold out, or he was actually mastering this system while pretending to campaign against it. We leave it to you to decide. GE was a major contributor to the 2008 Obama campaign. Jeffrey Immelt was then appointed to a board that makes regulation recommendations, which is to say, rules to drive the competition out of business. GE, during the period of Immelt's tenure at the White House, owned 49 percent of MSNBC, meaning that the station was effectively reporting on itself. The Treasury Department rewarded GE with an effective zero percent tax rate, and, indeed, with positive subsidies. We at Fakenation know that this kind of mafia behavior has long been the norm in American politics, across both parties. However, Obama is the first president pictured drawing it out in diagram form, as if to mock us by showing us he knows just how the game is played. That's a special kind of fakery, an unprecendented level of utter disdain for the intelligence of the average American, who is supposed to drink this swill uncritically. Don't expect to catch an analysis on MSNBC. > ISIS and Texas: Simpatico?